Chess Pieces: 2 Powers, 2 Roots. Digits (0 … 9), Blue goes first. B: Blue 4 at A4 moves to A6 and removes Red 2 at E6 and Red Power at B6. 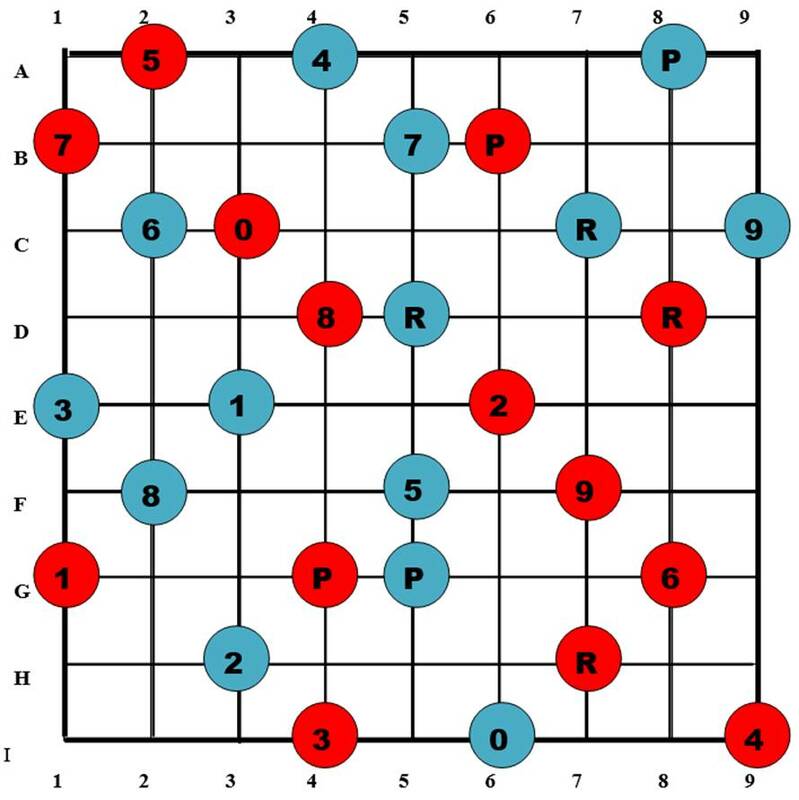 R: Red 5 at A2 moves to A5 and removes Blue 5 at F5 and Blue Root at D5. B: Blue 2 at H3 moves to H4 and removes Red 8 at D42 and Red Power at G4. R: Red 3 at I4 moves to I5 and removes Blue 7 at B5 and Blue Power at G5. B: Blue Power at A8 removes Red Root at D8. R: Red 7 at B1 moves to C1 and removes Blue 9 at C9 and Blue Root at C7. B: Blue Power at D8 removes Red 6 at G8. R: Red 9 at F7 moves to G7. B: Blue 1 at E3 removes Red 0 at C3. Game terminates. All Blue Operators were removed.